I am not ashamed to admit that I have the potential to be a crazy cat lady. I love cats. They all have super personalities (even the mean ones), they can be very cuddly, like to give massages, and they give attitude, which always makes life more interesting. Yes, sometimes cats can be jerks too, but usually there's a reason. I have had some amazing cats in my life, and a few of them ended up with serious health problems. One common denominator in these health conditions ended up being diet. I prefer to make my cat's food (supplementing with a good quality commercial food), and tend to recommend the same, but learning the natural eating habits of a cat, and their specific nutritional needs can help you find a commercial cat food that you're happy with. There are parts of this entry that will be very similar to an entry I wrote last month, but I promise that this one is specific to cats and their unique needs. 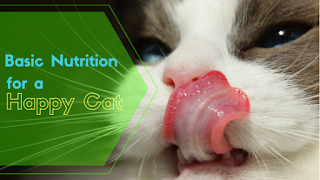 To start, here's a basic introduction to nutrition for cats. There are 6 major classes of nutrients: proteins, fats, carbohydrates, vitamins, minerals, and water. A well balanced diet contains a good amount of all 6. For energy needs, we count calories which are determined by proteins, fats, and carbohydrates. Vitamins and mineral are essential for proper immune and bodily functions. Water, is by far one of the most important nutrients as most life on earth is made up of at least 70% water. Proteins provide the building blocks of cell growth, repair, and maintenance. In domesticated animals, proteins are mostly used for the maintenance of fur and hair. They are made up of 20 amino acids, 10 of which are produced in the body. The other 10, termed “essential amino acids,” must come from the diet. Arginine, histidine, isoleucine, leucine, lysine, methionine, phenylalnine, theronine, tryptophan, and valine are these essential amino acids. If the diet is lacking in just one of them, the body cannot make proteins effectively. Animal proteins are much more bioavailable, and therefore easier for the body to use, than plant proteins. Fats provide the most concentrated form of energy as well as fatty acids which are essential for maintaining normal, healthy cells. They also help in absorbing fat soluble vitamins such as the vitamins A, E, D, and K. Not to mention, fats just taste good. However, there are two fatty acids that are super important for normal cellular activity, omega-3 and omega-6. Most animals need more omega-6 than omega-3 to maintain health. Vitamins and minerals are essential for daily function of the body. Having a diet deficient in any of them could cause major health issues. Both vitamins and minerals are needed in small amounts, but the important thing is to remember the balance. Balance is especially important with minerals because if you have too much of one, you might interfere with the absorption and usage of another. Cats evolved in dry, desert areas, where there wasn't much water. They got most of their water from the juices of their prey. We can see evidence of this in our little home-tigers, when they're picky about their water, or just don't drink often. So when you are thinking about cat food, keep in mind that you want to provide plenty of moisture with it. This is why wet food is typically preferable to kibble. When you're buying cat food, make sure that the listed ingredients are whole foods. Ingredients are listed in order of quantity, largest amount to least amount. Check to make sure the meats are listed first. Try to find food that lists a specific type(s) of meat and not a generic “meat” meal. Aim for products that use natural preservatives such as tocopherols (Vitamin E) and Vitamin C. Natural antioxidants (rosemary extract) can also be used as preservatives. Avoid by-products (meat or otherwise), sweeteners, artificial colors, artificial flavors, and artificial preservatives. Cats are carnivorous. This means that they need to consume a lot of meat in order to get their necessary nutrition. Cats do consume the stomach contents of their prey, so some vegetables are in their natural diet, but keep their food content mostly meat and very light in carbohydrates. If you decide to make your own cat food, there are a few other things to keep in mind. First, raw food is a really great idea for your cat. The feline digestive track is naturally able to fight most food-born illnesses off, much more so than dogs. However, since the large portion of their wild vegetation consumption is second hand (eating the, partially digested, stomach contents of their prey), I recommend making sure to cook the vegetables you add to their food. I recommend making a cat food of 30% cooked and 70% raw for maximum nutrient absorption. What works best for my home is spending one day a week cooking a little extra food for the kitty and keeping that refrigerated. I also take some time, that same day, to mix up some raw food, pre-portion it out, and freeze the portions (freezing will help to get rid of a lot of potentially harmful bacteria). When I go to bed at night, I pull out one portion and place it in the fridge for the cat's breakfast. I mix the raw and the cooked together each meal. I also sprinkle in some tasty, nutritious herbs, such as nettle or turmeric (you can opt to cook these in with the vegetables as well). These herbs help increase vitamin and mineral intake as well as add to the flavor of the meal. A quick internet search can help you find several recipes to try. Having several good recipes on hand is a good way to make sure your furry friend gets all the best nutrition possible. I hope this entry has helped introduce you to a good bit of the basics of feline nutrition. If you have any questions or comments, please leave them below! Dr. Kidd's Guide to Herbal Cat Care by Randy Kidd, D.V.M., Ph.D.